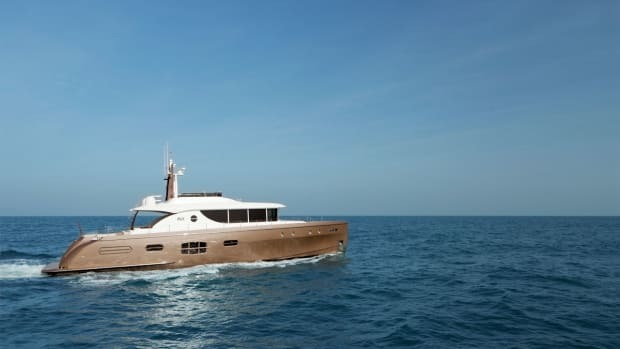 Nordhavn’s attractive aft-pilothouse design proves uniquely well suited to live-aboard cruising for an American couple seeking an active retirement and a different way of seeing the world. 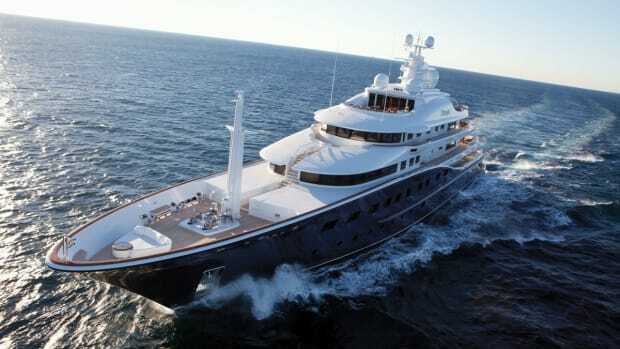 For prospective yacht owners planning to measure their time aboard in weeks or months, and their cruise itineraries in hundreds or thousands of miles, design priorities tend to skew more toward ensuring the permanence and sustainability of their seagoing environment, and perhaps less toward showy extravagance. 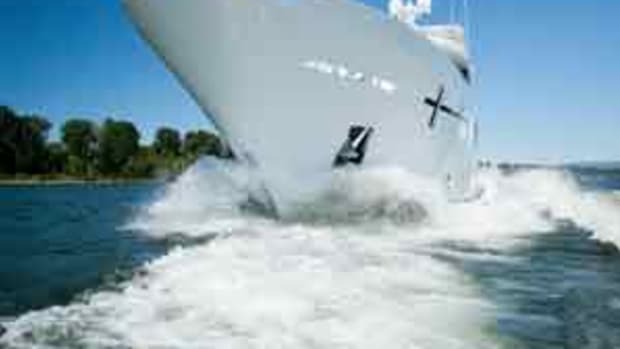 Not to imply that the two sets of attributes are mutually exclusive; indeed, durability and quality are, if not synonymous, certainly complementary terms, and if a first-rate live-aboard cruising vessel looks, acts and feels the part, then it’s all the more likely to make each odyssey worthwhile. 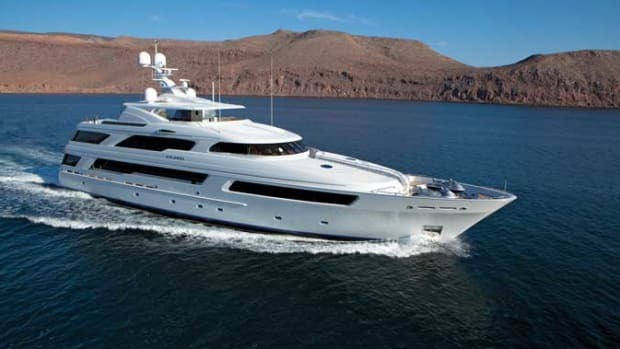 Case in point: Eliana, a recent entry in Nordhavn’s growing fleet of 76&apos; aft-pilothouse motoryachts. From its headquarters in Dana Point, Calif., Pacific Asian Enterprises (PAE) has been busy with a flurry of deliveries to North American clients, and the 76 represents a healthy portion of that business. Not without reason, for its underlying design offers a functional arrangement within a purposeful ­exterior style consistent with its long-range mission. Built to its standard specification, the 76 presents an attractive package, but as PAE actively encourages ­client involvement, most if not all Nordhavns reflect some degree of customization, sometimes purely cosmetic but often considerably more extensive. 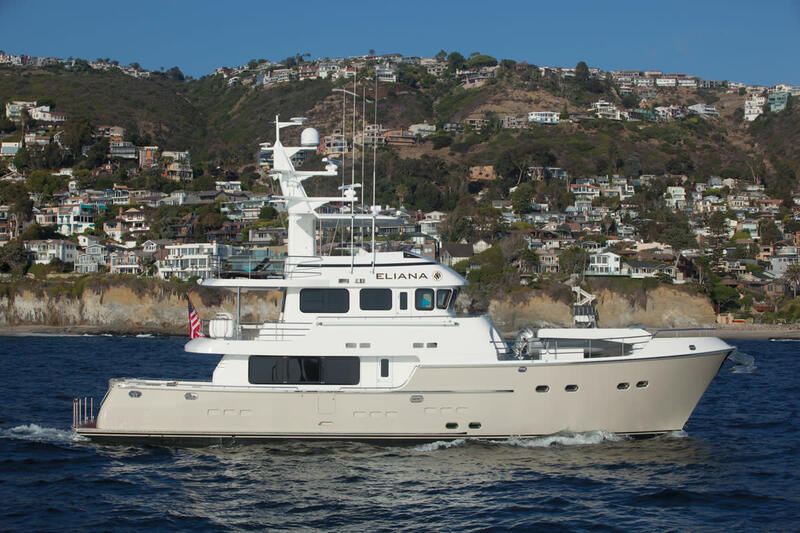 Given the clarity of their vision and their eagerness to participate actively in its creation, Eliana’s owners, Rick and Debbie Heiniger, have placed their new yacht squarely at the custom end of the spectrum. In general, the Heinigers were seeking a retirement lifestyle that they could enjoy as a couple. “We were thinking about a second home,” says Rick, “but could never settle on a single location. We both enjoy traveling, but don’t particularly like hotel life.” If that sounds like a job description for a long-range yacht, the Heinigers would agree. But in which form would their boat best meet their objectives? The owners envisioned a “living environment that could move with the seasons to any location we chose. It needed to be small enough for just us, and at the same time large enough that we could comfortably have a few guests. Outstanding seaworthiness was paramount for both safety and flexibility.” Mindful of the available time and flexible schedule more or less inherent in retirement—and equally sensitive to environmental considerations—Rick and Debbie opted for single-engine propulsion for their full-displacement yacht, and today, well into a busy inaugural cruise season, emphatically uphold that choice. “Cavalier attitudes about fuel economy are out of date,” says Rick, adding, “Our Detroit 60 (series) peaks torque at 1,200 rpm. 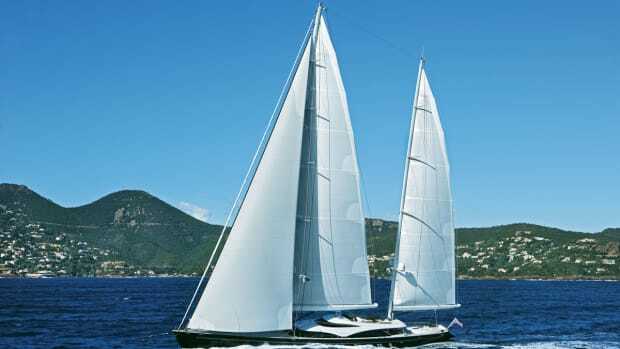 At 1,400 we get 8-plus knots at less than a gallon per mile.” A bulbous bow helps maximize range and, resistant as it is to pitching in open water, aids ride comfort; a Lugger 1064A wing engine powers selected hydraulic systems while providing backup propulsion if needed. Few destinations will lie beyond Eliana’s reach. As planned, Eliana since commissioning has served as the Heinigers’ primary residence, and so far has logged nearly 2,000 miles on an ambitious inaugural cruise schedule. 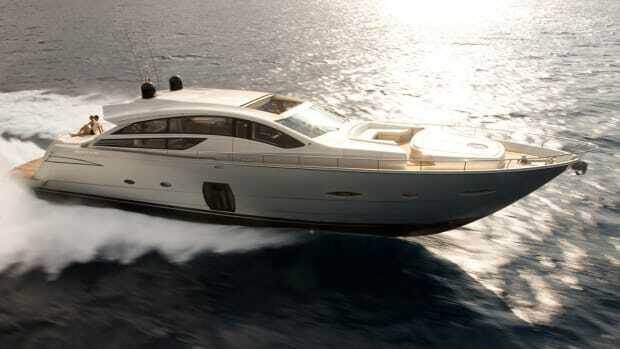 Along the way, the owners have enjoyed their yacht’s inviting interior ambiance. While their original intent was to develop a purely traditional motif, a visit aboard another Nordhavn yacht (a creation by Northwest-based Ardeo Design, which has worked on many Nordhavn interiors) led them to favor a more contemporary look, a preference they articulated to Ardeo Design’s Scott Cole upon enlisting his talents at an early stage of the two-year-plus project. The result is an understated-yet-welcoming theme anchored in geometric patterns and mid-tone joinery, and softened with eased cabinet corners and textured-fabric wall coverings. “We decided on a medium-tone, quarter-sawn, horizontal-grain African cherry wood joinery,” says Cole, “combined with a woven wall covering above a minimalist wainscot for the interior architecture to create a lighter, more casual ambiance.” For depth and contrast, light tones of anigre grace cabinet tops and, along with darker Alpi wengé on bed frames, nightstands and tables, complement the cherry. Alpi, a sustainable reconstituted wood product from Italy and certified by environmental organizations including the Forest Stewardship Council and OLB (Origin and Legality of Timber), offers a responsible alternative to less carefully managed sources. Botticino marble countertops and porcelain tile in the galley and the heads complete a richly organic palette extending throughout the boat. The main deckhouse sole extends from the cockpit to the forward galley bulkhead on a single level, an attribute that has allowed greater flexibility in salon arrangement—and the inclusion of a six-place dining table in lieu of a built-in dinette—but also seems most conducive to safe, unobstructed passage within the main cabin. The galley, replete with Sub-Zero and Miele appliances, occupies the forward starboard quadrant of the main-deck cabin; just opposite is a compact vestibule offering stair access forward to the master suite, down to guest accommodations and up to the pilot house, and to a dayhead at the port side. Just three steps below main-deck level, the master stateroom cabinetry and paneling emphasize the joinery’s predominantly horizontal grain. A king-size island bed faces forward toward a good-sized his-and-hers bath with large shower and a separate compartment for the w.c. Like all interior spaces—and many outside venues—this accommodation features extensive LED lighting, favored by the owners for their low-temperature operation, long service life and low power draw. 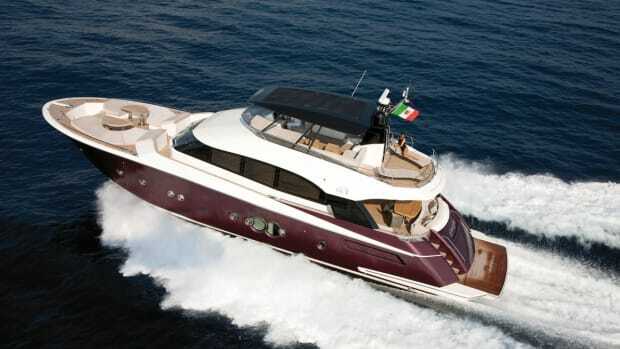 Two guest cabins, both ensuite, occupy the lower deck amidships. Behind its signature Nordhavn reverse-angle windshield, the pilot house provides good visibility from either of two Stidd helm chairs. Forward, aft and to the sides, large windows open up the view. For visibility and comfort, the shipyard also included windows in the forward and aft bulkheads of the captain’s (or third guest) cabin. A raised banquette on the starboard side seats guests at a pedestal table sufficiently large for refreshments or casual dining. A navigation center with a swing-out stool is tucked beneath the flybridge access stairway on the port side, and a head just aft serves the adjacent stateroom or for daytime use. Dutch-style weather doors on either side open to walkaround decks for access aft to a sheltered lanai with a settee and table, or forward to a Portuguese bridge that leads to the foredeck. 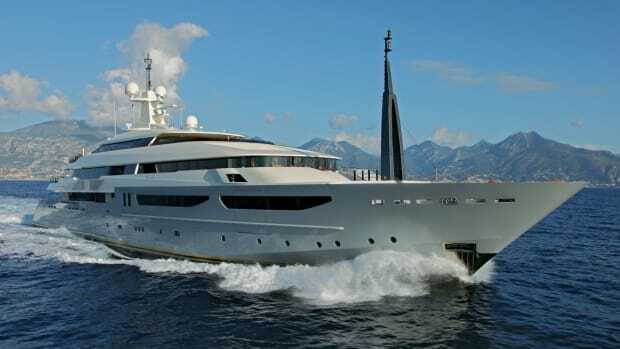 There, logically enough, the aft pilothouse design leaves plenty of deck space for a hydraulic crane and chocks for securing the ship’s tender, and for the hardware capable of handling the yacht’s twin 300-pound plow anchors. 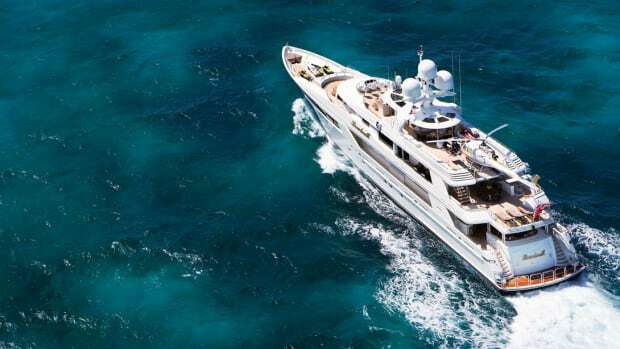 On the flybridge deck is a second helm station with two additional helm chairs and an observation lounge arranged beneath a hardtop supported on a substantial signal mast. Aft at this level is a mezzanine sun deck overlooking the cockpit two levels below; with its gas grill and dining settee, it is an agreeable location for dockside entertaining. Here, a retractable fabric awning extends aft to shelter the entire cockpit area against sun and rain.